Born on Thursday 14 May 1953, in Phnom Penh, His Majesty King Norodom Sihamoni is the son of His Majesty Norodom Sihanouk, King of Cambodia and of Her Majesty Queen Norodom Monineath Sihanouk of Cambodia. The King of Cambodia is the head of state of the Kingdom of Cambodia. The King's power is limited to that of a symbolic figurehead to whom people are to give love and respect. 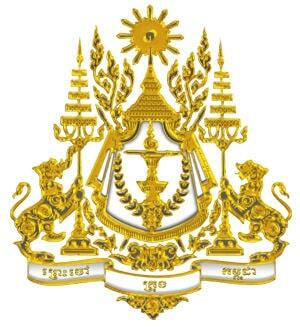 The monarch also represents peace, stability, and prosperity to the Khmer people. The King of Cambodia is an elected monarch, making Cambodia one of the few elected monarchies of the world. The king is elected for life from among the members of the royal family who are at least 30 years old by the Royal Council of the Throne which consists of several senior elected and religious figures. King Norodom Sihamoni has 14 half-brothers and half-sisters by his father's various relationships; his only full sibling, a younger brother, HRH Samdech Norodom Narindrapong (born 1954) died in 2003. Before he was crowned king, his royal title was: Sdech Krom Khun, equating him to the rank of Great Prince. As king, his title is: Preah Karuna Preah Bat S�mdach Preah B�romneath Norodom Sihamoni Preah Mohaksat Nai Preah Reacheanachak Kampuchea (in romanized Khmer); roughly translating to: His Majesty, King Norodom Sihamoni of the Kingdom of Cambodia. His given name, Sihamoni, comprises two morphemes from his parent's given names, Sihanouk and Monineath. 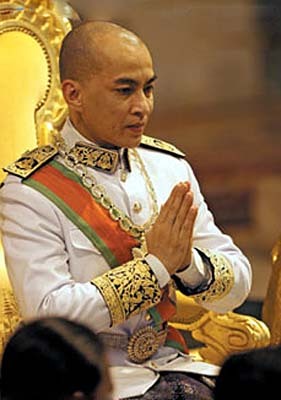 On 12 December 2008, Sihamoni selected twenty-six members of the Cambodian royal family to his advisory court, among them his half-brother Prince Norodom Ranariddh as chief advisor. Other choices included Prince Sisowath Sirirath, Princess Norodom Marie (estranged wife of Prince Ranariddh) and Prince Sisowath Thomico.